Simulations performed by LMU biophysicists, in which both environmental and demographic fluctuations were modeled for the first time, indicate that cooperative interactions favor the survival of bacterial populations in variable habitats. Like other biological communities, bacterial collectives engage in social interactions that promote their survival. However, not all the members of any given population necessarily benefit from cooperative actions. For example, cells that produce and secrete compounds that stimulate population growth often grow at lower rates than non-producers because the synthesis of such agents requires the expenditure of energy. In spite of such fitness costs, cooperating bacteria that synthesize and share such ‘public goods’ are found in many bacterial populations – a finding which appears to be at odds with the Darwinian principle of the survival of the fittest. The LMU physicists Professor Erwin Frey and Karl Wienand, in collaboration with Professor Mauro Mobilia (University of Leeds), have now looked more closely at this phenomenon. Their study, which was based on mathematical simulations, demonstrates that cooperators have a greater chance of surviving than non-cooperators if the “quality of life” provided by their environment is subject to strong fluctuations. The new findings appear in the journal Physical Review Letters. 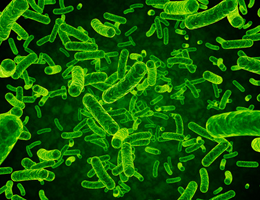 The researchers simulated the growth dynamics of a well mixed colony made up of two bacterial strains, one of which displayed cooperative behavior while the other did not. The two strains competed for resources, whose level varied at random between abundance and scarcity. The simulations indicated that, the cooperative strain is significantly more likely to survive in a fluctuating environment than it is when conditions remain constant. If the concentration of nutrient resources is varied, colony size shrinks when times are hard and cell numbers can fall to very low levels. Under such conditions, demographic fluctuations have a greater impact, and in small populations the non-cooperating strain is more likely to become extinct – and in the absence of competition the slower growth rate of the cooperating strain becomes irrelevant and the cooperators prosper.